Still using traditional two cylinder yard ramps at your warehouse facility? If so, you may be missing out on more efficient loading and unloading of materials. We’re pround to announce we’ve updated the hydraulic pump design on Copperloy’s lineup of OHSA-compliant industrial yard ramps, and the results are in! These re-designed one cylinder yard ramps are the time savers you’ve been looking for. 1. Faster Raise Times – Copperloy’s revamped, one-cylinder design uses less pressure to lift the ramp when compared to traditional yard ramps with two-cylinder hydraulic systems. This allows for not only easier operation, but faster raise time as well—up to two-and-a-half times faster than the average industry ramp. 2. Reduced Wear – A traditional two-cylinder pump can rise unevenly due to a variety of conditions, including general wear. Copperloy’s one centrally located cylinder guarantees that the ramp will rise evenly every time. 3. Improved Safety – Our new design provides greater stability because the hydraulic system is disengaged while the ramp is in use. 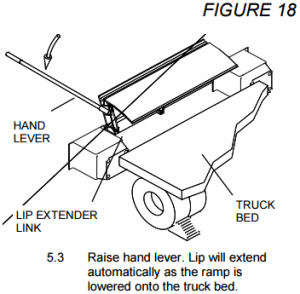 This allows the ramp to work in unison with raising and lowering of the truck. 4. Easy Pump Access – The pumps location on the outside of the ramp frame allows for easy access at all times. 5. Reduced Potential for Tire Issues – Solid-filled pneumatic tires can handle rugged terrain without the potential for punctures or air pressure problems. 6. Relocated Rotation Point – Rotation occurs on the redesigned positioning sleeve instead of the ramp connection, reducing wear on the ramp structure. 7. Improved Position Sleeve – Three points of connection greatly reduces the likelihood of disconnection during irregular maneuvers. Watch the comparison video below showcasing the time-saving efficiency of Copperloy’s redesigned yard ramp versus standard industry ramps. Contact Copperloy to find out more about the benefits of one-cylinder hydraulic yard ramps. According to the Bureau of Labor Statistics, falls, slips and trips accounted for 247,120 cases of on-the-job injuries at U.S. private industries in 2014. Warehouse and manufacturing facilities have the potential for workplace accidents. That’s not surprising when you consider all the equipment required to load and unload trucks. Here at Copperloy, we take every precaution in our own facility, and we want to share some of our top tips for keeping your loading dock clear of potential hazards—and your employees safe. Also, be sure to check OSHA for the latest loading and unloading regulations. Want to share this Copperloy infographic on your site? Use the following embed code. Are You Maintaining Your Edge of Dock Leveler Properly? You’re busy. We get it. You’re moving loads in and out of your facility all day, every day. Taking time for recommended maintenance of your dock equipment can seem like a time drain—but you’ll be glad you did. As with any equipment, maintaining it now means fewer big-ticket repairs down the road. Just imagine how long your car engine would last without routine oil changes. Just as sticking to the manufacturer’s recommended maintenance schedule for your vehicle helps ensure reliable transportation, scheduling time for maintenance checks on your edge of dock leveler can actually save time and money down the road. And better to schedule time now rather than endure downtime when a critical load needs to leave your facility. Fortunately, our EOD levelers require minimal maintenance, including the simple lubrication of hinges, which come equipped with grease fittings. Read on for step-by-step procedures for keeping your EOD leveler functioning properly. Before you service your edge of dock leveler, be sure to take necessary safety measures to avoid injury (and by injury, we mean serious injury. This is, after all, heavy-duty steel equipment capable of handling several thousand pounds.) Reading manuals can be tedious, but in this case, you’ll be glad you did. The EOD leveler moves toward you. Always return the edge of dock leveler to the stored position after service. Got it? Good. Now you’re ready to insert the maintenance strut. Using the hand lever, position the EOD leveler in the full back position. See Fig. 18 from the manual for reference. 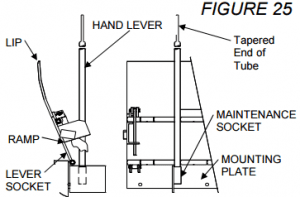 While one person holds the hand lever down (Fig. 18 again), another person standing on the drive surface must position the lip to its full upright position. Take a look at Fig. 25 from the manual to confirm correct positioning. With the ramp and lip in the full upright position, move the lever to the maintenance socket location. See Fig. 25 again for reference. Safety precautions? Check. Equipment prep? Check. Now you’re ready to tackle the task at hand. Remember, your Copperloy equipment is warrantied to be free from defects in material and workmanship under normal use for a period of one year, provided that the purchaser maintains and operates the edge of dock leveler in accordance with the owner’s manual. Go by the book! Every 90 days, with the dock leveler in the maintenance position, inspect all moving parts for wear or damage. Repair or replace as necessary. Inspect all welds, and repair or replace as necessary. If linkage parts must be replaced due to wear or damage, raise the leveler to its rear-most position by means of the hand lever and secure with the maintenance strut. Again, reference Fig. 25 from the manual. Lubricate all grease fittings every 90 days. To increase spring tension, turn bolts in evenly. To decrease spring tension, turn bolts out evenly. Every 90 days, inspect the dock bumpers: 4” of bumper protection is required. Worn, torn, loose or missing bumper must be replaced. Every 90 days, check all labels and replace as necessary. You can find a list of part numbers for your edge of dock leveler on page 26 of your owner’s manual or download the PDF. Every 6 months, verify that you have the latest manual. Follow the link above for the most current version. Hydraulic edge of dock levelers only: Seasonally change the hydraulic fluid for ambient temperatures, or if there is any evidence of accumulating condensation creating water contamination. Finally, don’t use brake fluid or any other fluids not approved by Copperloy. Use of such fluids may degrade the hydraulic systems seals and hoses. The first choice for fluid is Citco AW-46(200) hydraulic fluid. This is the fluid we normally supply with your unit. It’s suitable for an ambient temperature range of -10°F to 100°F (-23°C to 38°C). We’re confident these steps will become second nature, once you get on a routine maintenance schedule. Have other maintenance-related questions? We’d love to hear from you. Contact us today. If you ever done a kitchen remodel, you understand how much work goes into it. There’s demo of the existing cabinets and countertops, new drywall and electrical work. But before you even begin the demo part of the project, you need to consider work flow. Do you want an island for additional storage and food prep? Should you move the refrigerator to another wall to expand countertop space and cabinet storage? So many questions, but they need to be answered if you want your new kitchen to function well for you and your family. The same goes for your warehouse facility when you’re considering new loading dock equipment. Perhaps your loading dock equipment has seen better days, or you just want to improve efficiency in your warehouse facility. No matter what the reason, you first need to understand your current layout before changes can be made. Before we can suggest the right loading dock solution for your facility, we need to understand exactly what your needs are. What type of equipment are you currently using? Have your material handling needs changed since starting operations in your warehouse? We’re usually able to gather all the information we need over the phone, but we do rely on our distributors to supply further details. If necessary, they can visit your facility to get a better understanding of your present work flow. If we determine that a particular yard ramp is the best solution for your facility, the next step is determining the needed capacity. For that, you need to know your equipment specs. Will you be running forklifts on the ramps? What is the weight of the forklift and the max load it will be carrying? Other important measurements include dock opening, truck height, the width of the door opening and the width of what is using the ramp. These numbers are critical for ordering loading equipment that will work seamlessly with your current dock setup. We understand that sometimes customers need a solution sooner rather than later. In this case, we usually recommend an in-stock item. From yard ramps to dock lifts, we have a variety of solutions ready to ship to your location. But what if you have a unique loading dock need? We can handle that, too. We had a customer who needed wider ramps so his product wouldn’t hit the curbs on the way up the ramp. The problem with wider ramps is that they often will not fit in standard trailers. We solved the customer’s dilemma by making a special lip that would fit in all truck trailers and support the ramp. Is your facility in need of a loading dock equipment upgrade? We’re here to help. Contact us to find your solution today. Your loading dock needs to be efficient as well as safe. Docks can be a dangerous place, especially when forklifts are in use on uneven grades. The risk for injury increases dramatically. Dock boards, as well as yard ramps, bridge the gap between elevations to help stabilize forklifts and keep your employees safe. With a dock board or a yard ramp, you’ll enjoy a more productive, more efficient and safer work environment. Copperloy produces a huge array of dock boards and plates with different capacities, features and specifications. Did you know that a dock board can be a ramp as well? Even if there isn’t a height difference at the dock, dock boards are still ramps and vital to safe material handling. We offer dock boards as well as plates in both aluminum and steel, with multiple curb options. Have a unique loading dock need? Even if your warehouse design is unique, our engineering team can help with a custom solution. There’s no challenge too difficult, and no specification or circumstance too unique—we can develop the perfect solution, tailor made for your real-world application in three easy steps. 1. Initial Call – When we get your initial call, we’ll gather the details for your specific application, including any necessary measurements, such as dock height, weight of your equipment, width requirements and any restrictions. 2. Engineering Department – Our team of talented engineers reviews your specifications and a meeting with the production manager provides you with the time it will take to fabricate your custom solution. 3. Final Design and Pricing – Next, we reach out to local material providers to obtain current pricing. A design is drawn for approval, and cost determined. We send the quote to you for review. Our engineering team has supplied a number of custom solutions, including a two-piece ramp design for a company in Macedonia, Ohio, which manufactures industrial wire and cable. Copperloy was able to design the ramp to handle the large weight capacities of trucks, plus the cable or wire being hauled. The 50-foot-long ramp also allows for trailers with low clearance to drive into their building. Find out more about this custom manufactured dock-to-ground ramp. And our custom solutions aren’t specific to industrial or warehouse settings. We also designed and built a ramp 99 inches wide for use on a farm in Bowling Green, Ohio. This customer needed a wider-width ramp to load material onto a drop deck trailer. While our standard yard ramps are available in 70 or 84 inch widths, our engineering team was able to determine a way to provide the necessary specifications for the client. Read more about the shipping challenges we overcame for this particular yard ramp solution. Have a unique material handling or dock ramp need? Copperloy is here to help with your custom design solution. When you need a yard ramp for your loading dock sooner rather than later, don’t overlook the possibility of purchasing used equipment. Used ramps are in stock and available faster than a new ramp made to order, and the price is usually lower than purchasing new. Buying used allows you to increase productivity at your facility that much faster. While concerns about reliability are valid, you can alleviate those fears by asking a few simple questions prior to making your purchase. Has the used ramp been inspected? At Copperloy, we use a 44-point detailed inspection checklist to certify that your used yard ramp is in excellent working condition. Some examples of things we check are structural integrity, hydraulics and overall working order. The more detailed the inspection, the better. Is the ramp covered under any kind of warranty? 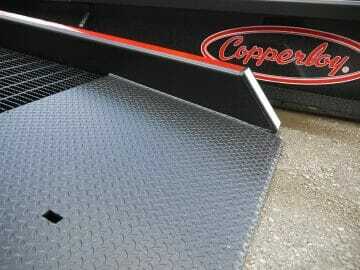 At Copperloy, we inspect and then resell only Copperloy-branded yard ramps. We’re able to offer a 6-month warranty on the hydraulic portion of the ramp, as well as a 3-year warranty on the ramp structure. If the used ramp you’re considering doesn’t offer any type of warranty, you may want to reconsider your purchase. Are used ramps available to Copperloy distributors? Yes! Let us know what your customer needs, and if we have a used ramp in stock that matches those specifications, we’ll certainly let you know. You fulfill your customer’s request that much faster and at a lower cost. Recently, we had a customer that needed a ramp in a hurry. While our standard ramps are usually constructed in about 2 weeks, this particular client was on an accelerated schedule. We happened to have a used ramp in stock that fit their application. As far as timing and cost, the ramp was a perfect fit. The customer also benefitted from our detailed inspection and the peace of mind a factory-certified product provides. In the market for a used ramp for your warehouse or industrial facility? We can help narrow down your search. Contact us today to find out more. Recently, we were approached to build a custom ramp for use on a farm in Bowling Green, Ohio. The ramp, with a 20,000-pound capacity needed to be 99 inches wide. The customer required a ramp with greater width in order to load material onto a drop deck trailer. 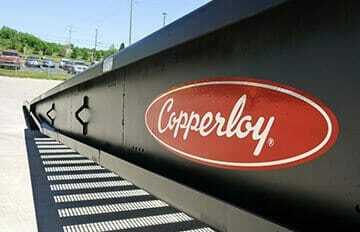 With over 60 years of experience, Copperloy has become an industry leader in dock equipment and yard ramps. Our team of professionals is always up to the challenge of finding solutions to new problems. With our in-house engineering department, we can help design a custom product that will meet the needs of virtually any application. We can then turn that design into reality in our 70,000 square-foot steel fabrication facility. The standard yard ramps built by Copperloy are 36 feet long, available in widths of either 70 or 84 inches, and capacities from 16,000 to 60,000 pounds. From time to time, however, we are asked to build a custom ramp to meet the specific needs of one of our clients. A ramp with a width of 99 inches presented a new problem: it would not fit into a standard shipping container. We therefore had to weld a 91-inch custom extension plate to the top of the ramp, allowing access into seaport containers. The finished custom ramp is 36 feet long with an 8-foot level off on top. The length and the level off are both standard. Although this particular client did not require it, we are also able to customize a ramp to have a 10-foot level off. This ramp will need to be moved from farm to farm, a distance of roughly one mile. So, the customer requested the tow bar option, which will allow it to be towed at a low speed of 3 to 5 mph. This is certainly one of the more singular custom ramps we have built to date. So, if one of our standard yard ramp, dock ramp or loading dock equipment solutions don’t quite meet your needs, the pros at Copperloy are ready to design and build a custom solution that is right for you. So you’ve purchased a new dock to ground ramp, congratulations! Now it’s time to make sure you put it to use correctly. Copperloy provides all of our customers with detailed installation instructions and a comprehensive user manual, however, this quick guide can be used as a resource as well. First, of course, you’ll need to unload your ramp after shipment. Position two lifts, one on each side of the ramp, and have them engage the ramp, clearing it of the carrier and any supports. Have the carrier drive forward and clear the ramp, and the slowly lower the ramp to the ground, placing it atop wood blocks. You will then be able to position the ramp into place. To set up your dock to ground ramp, you’ll need to first attach its safety chain brackets to the dock face. Then, keep the bumper plates as close to the dock face as possible to prevent movement, and square up the ramp in position on the dock surface. Attach the safety chains to the brackets on the dock face, with as little slack as possible to keep it secure. It’s basically that easy, you have already successfully set up your facility’s dock to ground ramp. If you have any questions, please call our team at 800-321-4968“>800-321-4968. and we’ll be happy to provide you with more information or with another copy of your manual. When it comes to steel yard ramps, we insist on leading the industry, and in order to stay on top we need to use the best materials. A572-50 HSLA (High-Strength Low-Alloy Steel) steel plates make it possible for us to create ramps that provide superior strength in a surprisingly light package; two attributes that have our customers beating a path to our door. Why Use Copperloy’s A572-50 Steel Plate Yard Ramps? We’ve been doing this for over 60 years and we manufacture in the USA. Copperloy has an innovative in-house engineering team that can meet and exceed any project’s demands with superior customer service. Our 70,000 sq. ft. facility has the finest tools in the industry and our A572-50 ramps are constructed with solid steel side curbs to help prevent runoff, and serrated grating for high traction and durability. Snow and rain fall right through for an incredible lifespan and incredible durability. At Copperloy, we use hot rolled structural steel A572-50 plates because they are simply the best for the job. Tolerance, concentricity, and straightness are major factors in constructing a real workhorse of a ramp and strong carbide and nitride formers produce a small and fine grain, giving the best notch toughness. Each halving of the grain diameter produces a 50% increase in tensile strength. A572-50 steel is tailor made for our portable or mobile yard ramps, and our dock-to-ground ramps, where extra strength and reduced end product weight are paramount. What are the Main Features of A572-50 Plate Steel? Blend of columbium and vanadium. Trace elements of manganese, phosphorus, sulfur and silicon. Increased corrosion resistance with the addition of copper, nickel, silicon and chromium. Superior resilience and durability from a manufacturing process that requires 25% – 30% more power than standard carbon steel plates. Our A572-50 plate steel yard ramps are a little harder to form and a little heavier than aluminum but they’re the best option when you deal with heavy weights, and if moving a slightly heavier ramp isn’t a concern. The last thing you want to deal with is a ramp that can’t handle the loads you subject it to on a daily basis. Trust the strength and durability of A572-50 Steel and you will never be disappointed. Normal hot rolled steel does not guarantee structural properties. If you upgrade the steel to A36 it guarantees the steel strength to 36k min yield. At Copperloy we have upgraded to A572-50, which has a 50k pound minimum yield thanks to its more refined alloys, which give it more strength and weld-ability. We feel this is the best by far material to construct a yard ramp. Contact us at 800-321-4968 for more information about our steel ramps and how then can help you.